Judaism follows a lunar calendar; therefore, Hanukkah and other Jewish holidays occur on different days of the regular calendar each year. The only constant is the Jewish Sabbath—SHABBAT. The fact that Thanksgiving is as late as it possibly can be this year helps make this possible in the month of November. I will be leading a Hanukkah celebration at UAB Hospital in the North Pavilion Atrium on Monday Dec. 2nd from 11:45-12:15 including a menorah lighting, songs and fun. I hope you will join me. Hanukkah’s location in the Jewish lunar calendar does lead to its falling in November or December each year. This proximity to Christmas leads many to think of Hanukkah as a Jewish Christmas BUT it is not. With the secularization of Christmas, the lure of the holiday seasonal magic is hard to ignore and Jewish families can get sucked into the frenzy. The tradition of giving presents during Hanukkah is predominantly American. Hanukkah is actually considered a minor holiday and many don’t know its history or significance, assuming that Jewish people simply light candles and give presents. Join Chaplain Michael Horwitz for fun, singing, and lighting the Hanukkah menorah and learn about this Jewish holiday. While Hanukkah is a favorite holiday for Jewish children and families, it is not just a nice children’s story. It is instead the story of a bloody battle and a miracle. Hanukkah is not mentioned in Hebrew Scriptures but is found instead in the Apocrypha. In 167 BCE, Syrian Greeks took over the Temple in Jerusalem, defaced it, and destroyed the Scriptures. In the Maccabean revolt, led by Judah Maccabee, the Jews recaptured the Temple and had the freedom to worship again. Hanukkah commemorates the rededication of the Temple. At the time of this celebration, only one jar of oil could be found which contained only enough oil to last one night. Miraculously, the oil lasted for eight nights instead. Jews focus on the message that even small groups of people can make a big difference. It is important to stand up for things you believe in, and it is important to stand up for your faith, even if there are people out there who are trying to take it away from you. The lights are symbols of hope, community and faith. Yes, there is the story of the desecration of the temple and the miracle of the oil; however, this is NOT the real essence of Hanukkah. We learn the triumph over a secular world, the freedom to worship and the freedom of religion. Lighting the candles every night is a symbol, not only of the miracle of the oil, but also a celebration of the victory of a small group of Jews who fought for religious freedom. The wonderful thing about Hanukkah is that it is the only holiday that does not truly require being in the synagogue together as a community but rather it is meant to be observed as a family at home. 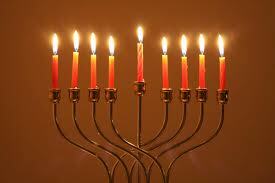 However, there is special liturgy in the daily prayers for Hanukkah that is added to the service. Most communities also have Hanukkah parties, concerts and dinners in Jewish Community Centers and Synagogues. Families gather around their dinner tables and light candles in succession each night for eight nights. The gift-giving and exchanging is a cultural thing. There’s nothing the matter with having fun, and there’s nothing the matter with getting gifts and feeling good about being Jewish. Special foods associated with Hanukkah include latkes (potato pancakes fried in oil), sufganiyot (jelly sugar coated doughnuts) and chocolate candies known as Hanukkah gelt. Yes, there is much more to Hanukkah than spinning a top known as a dreidel and yes there are many more songs than “I have a little dreidel”. Hanukkah has a sacred tradition of hundreds of songs and new ones are created each year by cantors and Jewish composers. Lighting the candles on the menorah every night is something Jewish families and individuals are taught to do in the evening based on the traditions and customs of the holiday. After dark each night, the candles are to be lit near a window and not blown out and special blessings and songs are sung. Children love to play the dreidel game and often sing songs and make Hanukkah craft projects. Giving to charity is also a part of Hanukkah. Like many other holidays, spending time with people you love is the most important aspect of the holiday. Eating meals together during Hanukkah allows families to discuss the Jewish faith and what it means to be Jewish. Candles on the menorah are generally not lit in the morning at home but are supposed to be lit in the synagogue each morning. Hanukkah lights can be thought of as “seeing light in times of darkness”.